We love our summers here at LifeBUILDERS! Kids day camp, youth internships, sharing the LifeBUILDERS story in churches, and before company boards of directors, supervising volunteer work crews helping us reclaim the neighborhood… there’s never a dull moment. But, it is also exciting watching the transition from summer to fall. It seems like, overnight, we look out our office window and see Kelly Road teeming with students coming and going from Chandler Park Academy. Many students are also at the bus stop, waiting to head to a different local school. Every year, we are reminded that our job doesn’t stop at Labor Day. The fall greets us with another opportunity to Empower our students, and what better way to empower, than to equip students with the supplies they need to start the school year off right? 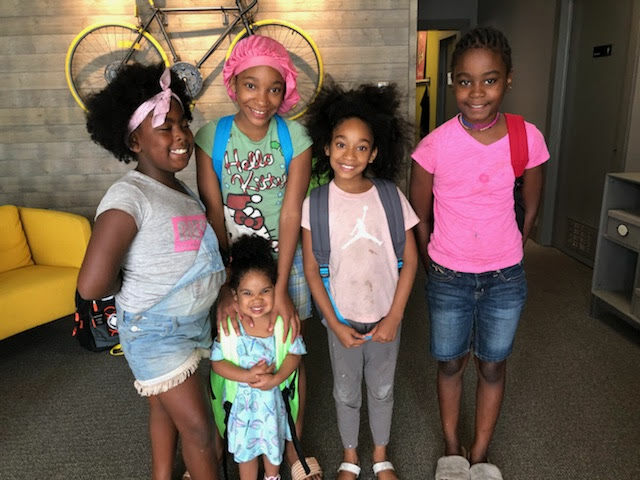 Thanks to the donations of many caring individuals, ministries, and organizations, we were able to personally distribute over 175 designer backpacks to students in our community. Not only did they receive backpacks, but your donations allowed us to fill those backpacks with the top items on the standard back-to-school list. This includes, paper, pencils, erasers, rulers, clue, hand sanitizer, and more. We want to say THANK YOU! But, who are we kidding… these smiles say it all! Newer PostHappy Hints & Good News for the New Year!